A single Danny Allen-Page strike four minutes before half time settled this competitive pre-season friendly in favour of Hayes & Yeading United on a sunny afternoon in Berkshire. Manager Garry Haylock gave a run out to ex Hayes FC midfielder Justin Cochrane as a triallist, with fellow triallists Simon Overland in goal, Sami El-Abd and Adam Green in defence and Craig Dundas up front. But it was Maidenhead who had the first effort on goal when Alex Wall beat Charlie Wassmer to a high ball but could only put his shot into the side netting. Hayes & Yeading enjoyed a lot of possession and were comfortably in charge for much of the first half, but it wasn’t until just before half time when they scored from their first meaningful chance. 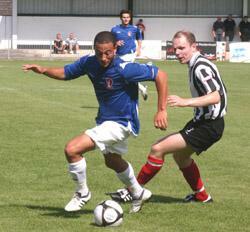 Craig Dundas dispossessed Jack Bradshaw and slid the ball inside to Dale Binns. Binns had a clear run at goal, but he unselfishly squared the ball to Allen-Page who arrived at the back post to smash the ball into the top corner. The second half was far more lively. 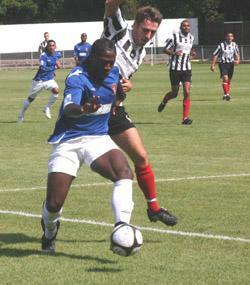 Maidenhead’s Bobby Behzadi, who in the past represented both Hayes FC and Yeading FC hit a long shot just past Overland’s post before at the other end, Allen-Page slipped the ball through the right hand channel for Dundas to turn sharply and shoot at goal, with goalkeeper Chris Tardif getting in a telling block. Kieron St Aimee was dangerous for Maidenhead and his run to the right hand by line and cut back for David Brown gave Maidenhead their best opportunity, but Tom Cadmore blocked the ball in typically brave fashion. Overland had little to do, but he did field a long Jack Bradshaw shot with security and he caught and held two deep crosses impressively. The home keeper also did well, especially when gathering in Cadmore’s long range free kick. 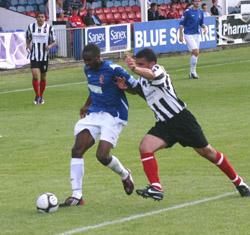 Maidenhead had three further opportunities towards the end but failed to hit the target with each one. Meanwhile, Scott Fitzgerald headed a Toby Little corner towards goal but Tardif was able to keep it out. United Line-Up: Simon Overland (Delroy Preddie), Danny Allen-Page (James Mulley), Adam Green, Tom Cadmore, Charlie Wassmer (Esmond James), Sami El-Abd, Ram Marwa, Marc Canham, Craig Dundas (Scott Fitzgerald), Justin Cochrane (Matt Day), Dale Binns (Toby Little).